Fry's Electronics, Inc. was founded in 1985 in Sunnyvale, California in a 20,000 square foot location by the three Fry brothers, John, Randy, and Dave; and Kathy Kolder. Fry’s is a closely-held private company, and all of the founders are actively involved in the daily operation of the business. Fry’s was founded as a Silicon Valley retail electronics store to provide a one-stop-shopping environment for the hi-tech professional. Fry’s continues to keep hi-tech professionals supplied with products representing the latest technological trends and advances in the personal computer marketplace. 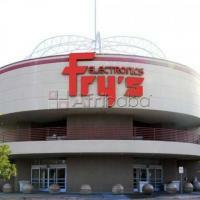 Fry's retails over 50,000 electronic items within each store, now totaling 34. There are currently 8 stores in Northern California, 9 stores in Southern California, 8 stores in Texas, 2 stores in Arizona, 2 stores in Georgia, and 1 store each in Oregon, Nevada, Washington, Illinois, and Indiana. The stores range in size from 50,000 to over 180,000 square feet. Each store carries its own unique theme. In Northern California, Sunnyvale reflects the history of the Silicon Valley. Palo Alto steps straight out of the old wild, wild west. Campbell’s ancient Egyptian theme displays King Tut tombs. Fremont’s 1893 World’s Fair theme is a flashback to the first city powered by electricity. San Jose pays tribute to the first astronomers, the Mayans, with settings from Chichenitza. In Southern California, Fountain Valley hails the ruins of ancient Rome, complete with a flowing aqueduct. Manhattan Beach takes you to Tahiti with sculpted lava tiki heads and its own rain forest. Woodland Hills is a page out of Lewis Carroll’s Alice in Wonderland storybook, with 10 to 15-foot high figurines of the story characters. Anaheim places you on the NASA flight deck for the Endeavor Space Shuttle, complete with launches on big screens all weekend long. Burbank pulls you back in time to the 1950’s with a retro-space theme from Hollywood, complete with little green Martians and Gort, the robot. City of Industry pays tribute to the industrial revolution with bigger-than-life gears. In Oxnard, the rich agricultural and commercial history of this coastal community is featured in historical wall murals. San Marcos takes you to Atlantis, with its aquariums, exotic fish, and waterfalls. In Texas, Dallas allows you to experience the Lazy-K ranch, complete with a herd of longhorn cattle. In Houston, you can view the history of Texas oil, complete with oil derricks. In South Houston, the city’s rich pioneer heritage is honored. In Irving, we pay tribute to its history, which is depicted throughout the store on mural-size photos. In Plano, we show how the railroad impacted the development of this thriving area. In Webster, murals depict the history of space exploration, together with a scale replica of the international space station. In Arizona, Phoenix is a journey into an ancient Aztec temple. In Washington, our Renton store reflects past historical events. Las Vegas, Nevada reflects the history of “The Strip.” In Downers Grove, Illinois, historical pictures of the train station, the Downer Family, and business sites of the city are displayed throughout the store. In Fishers, Indiana, we pay tribute to the origins of the pre-1960’s Indy Speedway. In Duluth, Georgia, old photographs show the pioneer days up to the 60’s. Alpharetta, Georgia displays photographs depicting the growth and history of the town. In Roseville, we honor the influence of the California railroad with a train engine crashing through the wall and a full-size train replica on tracks in the store. Currently, theme works are in progress in Sacramento, Concord, and San Diego, California; Tempe, Arizona; Wilsonville, Oregon; and Arlington, Texas.